Long before the term 'green architecture' was termed, Korean builders were devising ways to combat the hot summers and cold winters in their part of the world. These traditional passive heating and cooling techniques were so effective, that they are still used in many contemporary Korean homes. Today we're going to see how Korean builders Webil executed a contemporary home with some distinctive traditional touches. 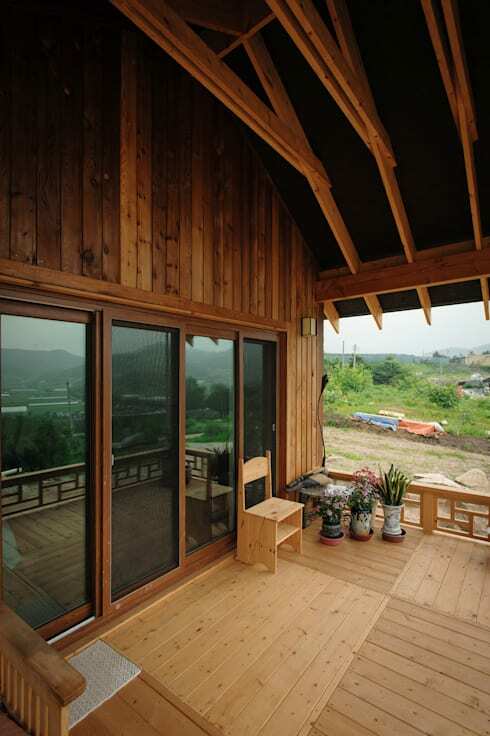 The two-level wooden home covers a total of 163.78sqm and the lovingly created construction took 150 days. So let's have a good look at the wooden facade and all its features! 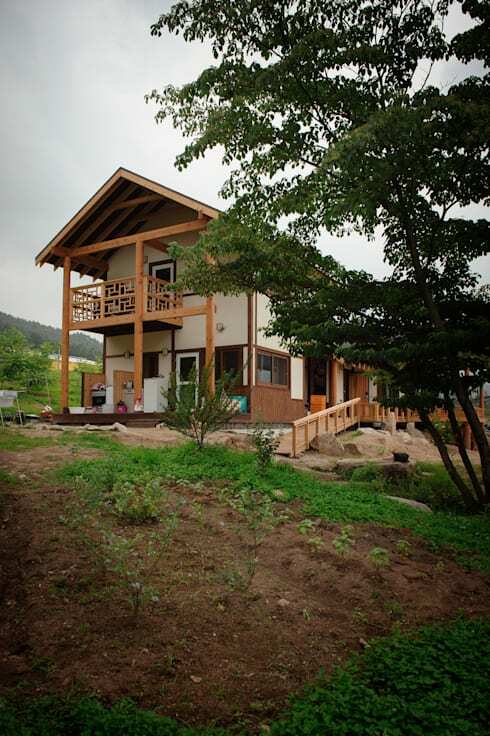 The home is a fusion of contemporary and traditional Korean architecture known as Hanok. Traditionally, these homes were wooden and designed as a simple line in hot areas, as a box-shaped design in colder areas and as an L-shaped design such as this in the middle of the country. This helps of course to control the amount of air flow throughout the home. 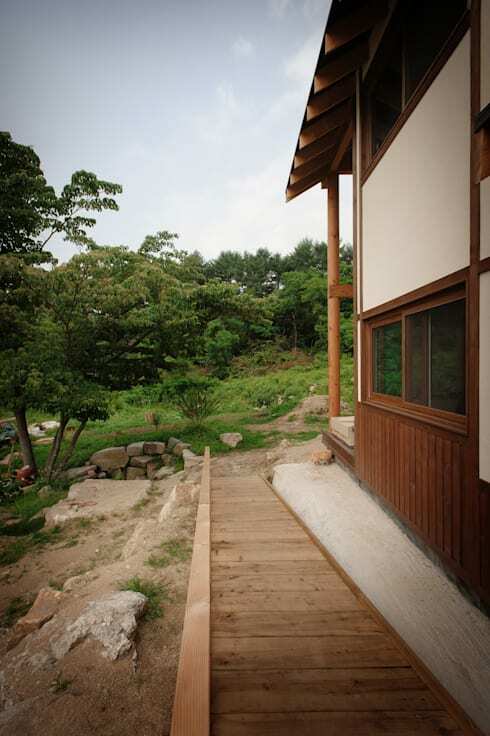 One of the most distinctive features of a hanok-style home is the floor. Here we can see how the wooden posts or 'daedulbo' as they are known, are inserted into the ground. The home is set on a slope, and the gap between the post and the wooden floor invites a cooling flow of air into the base of the home. The home is constructed with a lightweight Korean wooden frame and the bare, exposed beams give the structure a lot of homely warmth. This is accentuated of course by the use of a classic peaked roof. 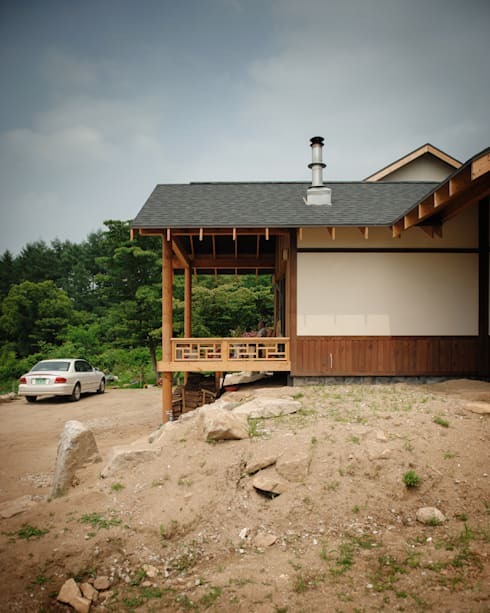 Like many eco-homes, this one has been constructed to avoid damage to the surrounding landscape. This area of the country receives only moderate rainfall so a small vegetable garden has been created on a gentle slope. The bold lines and shapes of the roof really dominate the design of the terrace. It stands in contrast to the relatively small and modest outdoor furniture we see here. This strong contrast is a common feature in this style of Korean home. Korean architecture often has a grand and impressive look, while still retaining the natural minimalism of many Asian homes. The outdoor areas have been kept incredibly simple and here we can see the simple wooden walkway running along the side of the home. We also get a glimpse of the subtle variations in the various external walls. Although the home runs to quite a height, it almost has just as much visual weight as the big stone boulders and lush green foliage of the garden. This is a home at peace in the natural surroundings. Now let's take a U-turn and have a look at a completely different wooden dwelling… A timber home in the woods to steal your heart. 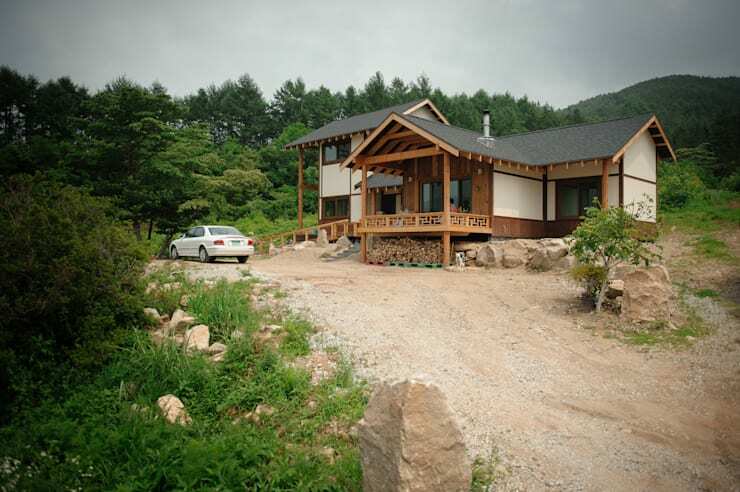 Are you a fan of traditional Korean homes?